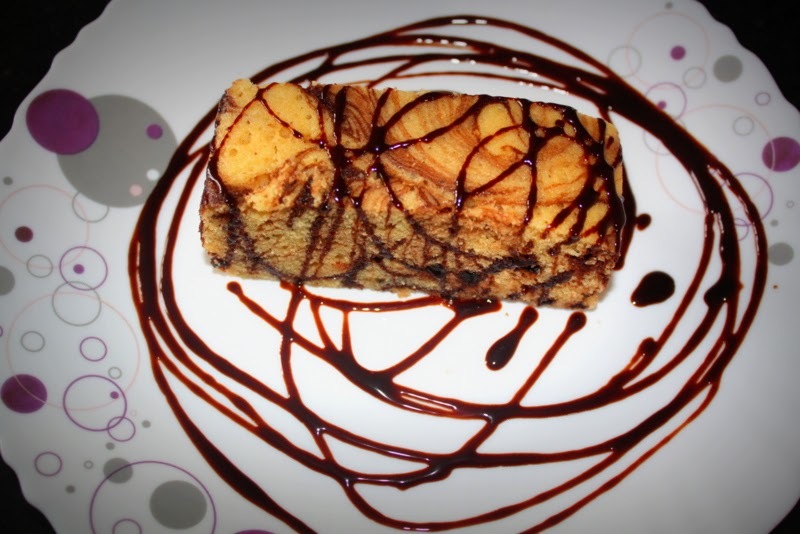 Marble cake is a classic teatime treat, its easy to prepare and also wonderful to look at!! Two cake batters are poured alternatively in the middle of the cake pan and it is then blended slightly with a knife or tooth pick to create a marble pattern. This creates a striped pattern similar to the Zebra. The choco and vanilla layers fascinated me from childhood days. You can add different flavors to the same recipe. I once made an orangle chocolate marble cake and that was yumm too. Its like a double treat, you can enjoy both the flavors in a single bite. This recipe is also very easy to put together and can be prepared anytime as a quick evening snack or even for an elaborate special occasion. Begin by pre-heating the oven to 180 C.Sift together maida, baking soda and baking powder in a bowl.Take the eggs in a medium mixing bowl and beat it nicely. Add the sugar, oil, vanilla extract and milk to this and whisk again to make a fluffy batter.Slowly add maida into the wet mixture while mixing continuously using the cut and fold method until you get a smooth batter.Divide the batter into two bowls. In one portion add the cocoa powder and mix thoroughly. In the other portion you can add choco chips for more flavour (Toss them in maida before adding them to the batter) This is optional, I like having some crunch in cakes. In a medium baking dish or a loaf pan grease the base with butter and dust with flour. Now take about 1/4 cup of the vanilla batter and pour in the center of the cake pan, next pour the same amount (about 1/4 cup) of the brown chocolate batter on top of the vanilla batter and in the center of the pan. Repeat the process alternating the batter. The batter will spread creating the zebra print. 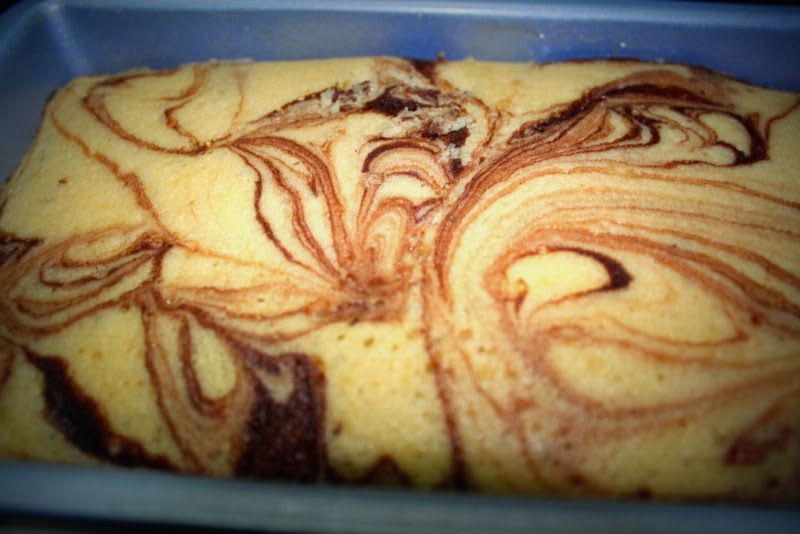 Using a knife or toothpick, swirl the batter to create a marbling effect. Place the cake pan into the preheated oven and bake for 30 to 45 minutes until the tester when inserted into the cake comes out clean. Once the cake is baked, remove from the oven and allow it to cool for at least 5 minutes before you an invert, cut and serve. Serve the delicious cake along with breakfast or as a tea time snack with a cup of coffee!! 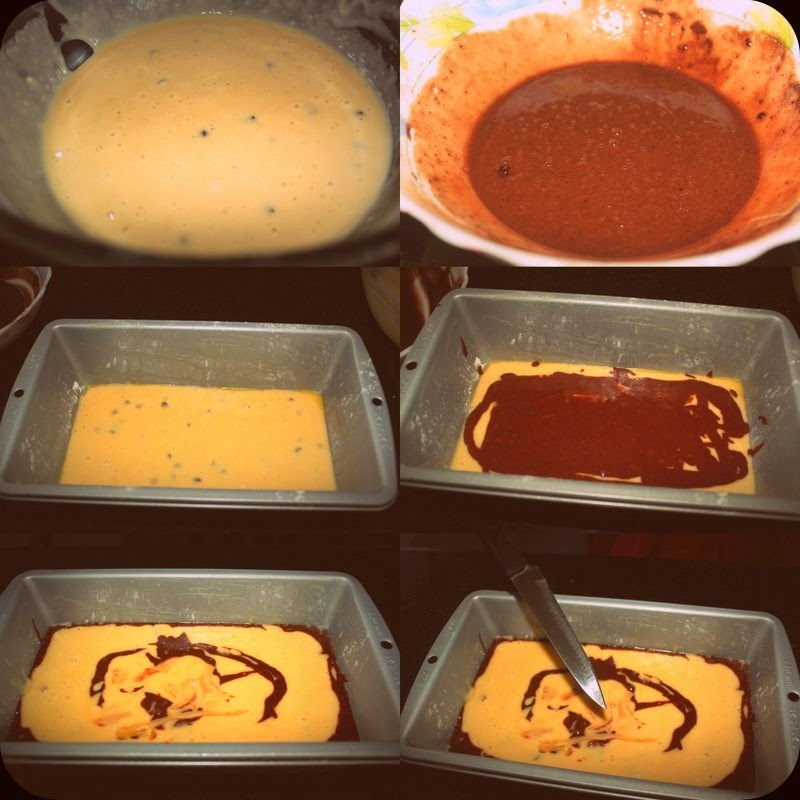 *While creating the marbling effect on the cake ensure that it isn’t done too much, or else the chocolate flavor will dominate the cake. If you love the aroma of fried garlic and the burnt veggies you are going to love this recipe! 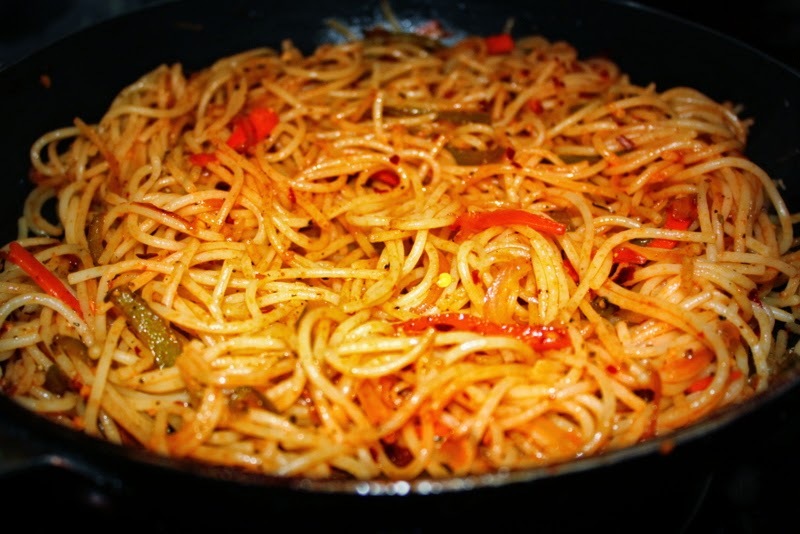 Hakka Noodles are quickly stir fried with a spicy Indian Chinese flavored sauce and crunchy vegetables. 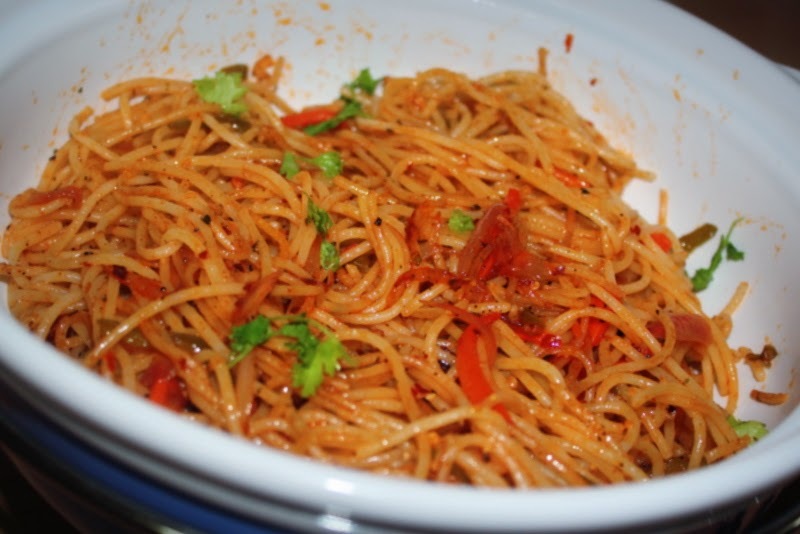 You can add lot of variations to this recipe and make your own favorite. Boil water in a sauce pan, add some salt. Cook noodles al’dente (as per package directions). Drain the water and drizzle some oil and set aside. 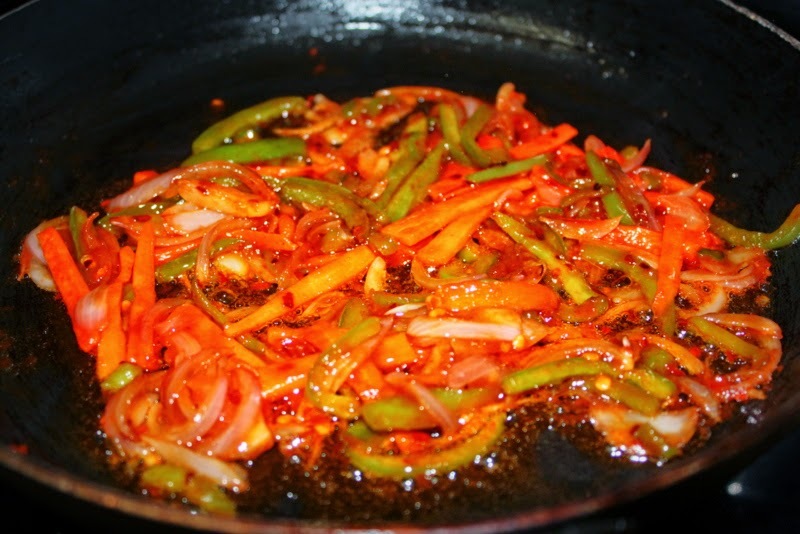 Heat a pan with oil and fry chopped garlic and add the veggies one by one frying each for half minute. Add the sauces, salt and pepper and give a quick stir. If you have a big pan try tossing the veggies in such a way that it catches fire. This gives the noodles that burnt and smoky flavor. Add the chilli flakes and the noodles and mix them well with the veggies. Fry them on high flame all the time. Cook for about 10 minutes and turn of the flame.